Wohl Italien 19. Jh. Speckstein, geschnitten und poliert, sowie weißer Marmor. Unsign. Sockel min. best. H. (mit Sockel) 23,5, B. 12 cm. Bookend with resting satyr. 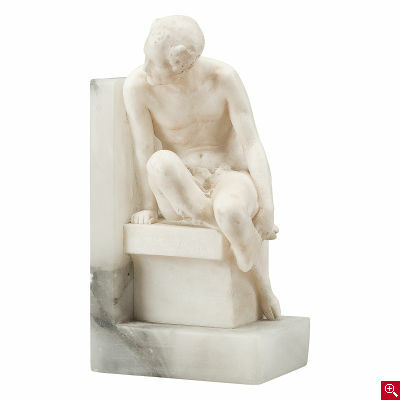 Probably Italy 19th C. Carved and polished soapstone as well as white marble. Unsigned. Base slightly chipped. H (including base) 23,5, W 12 cm.